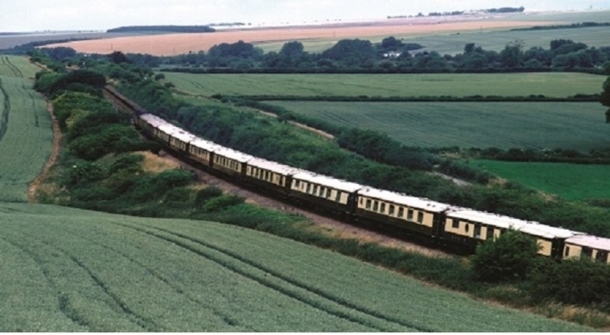 There’s still time to join St Catherine’s Hospice for an unforgettable trip aboard the famous Belmond British Pullman this spring. The sister train to the Venice Simplon-Orient-Express will be pulling into Horsham station on Saturday 18th May. This is a bespoke trip that has never been available locally before. Originally the luxurious train was going to transport guests to Windsor Castle. Regrettably Windsor Castle will now be closed on the 18th May due to the wedding of Lady Gabriella Windsor, daughter of Prince Michael of Kent. Now, with an unexpected Royal Wedding taking place, St Catherine’s has arranged for the Pullman to visit the historic Hampton Court Palace instead. Home of King Henry VIII and filming location for BAFTA winning film, The Favourite, it is a fantastic location suited to the opulent glamour of the vintage train. When you arrive at Horsham station you’ll be welcomed on board the impressive British Belmond train, into carriages restored to the glory of their 1920’s heyday. On your outbound journey, you’ll indulge in a Bellini Brunch accompanied by live music, so you are ready to explore Hampton Court Palace. At the palace you can enjoy costumed actors, a roasting meat in the kitchens and horse and cart rides (for approximately £6). There will also be time for a 35 minute boat ride from Hampton Court to the Kingston Centre (£10 return), to explore Bushy Park, or to indulge in a spot of retail therapy on East Mosley’s High Street, before you head back to Horsham. On your return journey, you’ll be welcomed back on board the opulent Belmond British Pullman with a glass of champagne before enjoying an exquisite three course dinner and wine. A very limited number of tickets remain for this journey on one of the world’s most iconic trains. To join this unforgettable trip please contact Hannah Shorter at St Catherine’s on 01293 447364 as soon as possible. The final date to buy tickets is Thursday 25th April 2019. Tickets are £420 per person. And will help raise vital funds to support local families living with a terminal illness in your community.